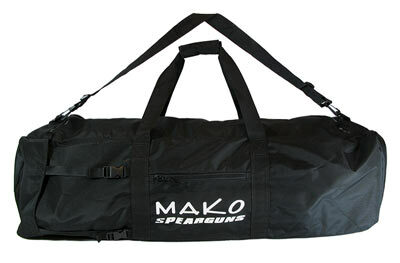 The MAKO Spearguns Freediving Gear Package 2 is designed to get you in the water with high quality and dependable gear without breaking the bank. Every piece of gear in this package has been used by some of the most experienced spearos hunting in the most demanding conditions in the world. Switch from plastic to fiberglass or carbon in seconds. No Glue Required! No mess! Made of a high tech plastic and fiberglass, specifically for high level freedivers looking for performance and durability. To upgrade this Freediving Gear Package to fiberglass or carbon blades, please call us at 540-361-1570. Designed exclusively for freedivers, our 5 panel High Cut freedive socks provide a custom like snug fit and will not fill up with water like the cheaper 3 panel socks - available in 3mm and 5mm thickness. Or choose our 2mm Low Cut Yamamoto Neoprene socks, perfect for warm water dives. Experienced spearfishermen and pure freedivers know the importance of a low volume mask. They also know the importance of achieving this low volume without sacrificing the field of view. The MAKO Minimus (aka MINI) takes this ratio of Low Volume vs. Field of View to the perfect equation, thus further minimizing the volume while maintaining optimum field of view. The slim design of our Freedive Snorkel drastically reduces friction while the ergonomic shape of the tube mirrors the shape of the your head so as to not obstruct the your vision. Start your freediving out right by using the belt preferred by freedivers. 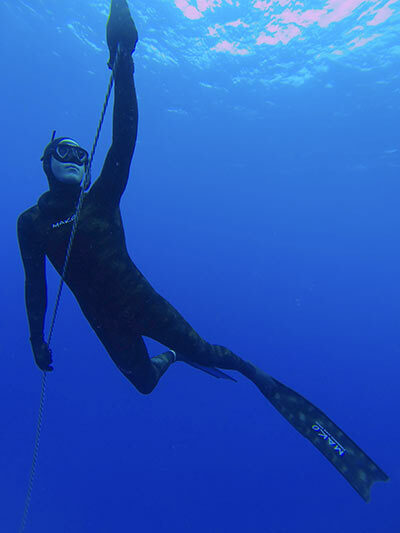 The rubber freedive belt can be worn much lower than traditional nylon belts, thus allowing significantly more air to be filled into the lungs. This is a professional grade kill knife for the serious spearfishermen. Made in Italy by the finest knife makers in the world. The new MAKO Freedive Gear Bag has 4 compartments, is waterproof and measures 41 inches long x 17 inches wide x 12 inches tall. More Freedive Gear Bag info here. Add one using the options above! Haven't had a chance to try out the gear yet, but wanted to commend Mako for their customer service. After receiving and trying on the fins and booties they ended up being too small. I sent them back to exchange for a larger size and had my new fins and booties in a week. Thank You! Great gear at a excellent price. Really like the gear and the price! I’ve dove 2 times the past week. The best snorkel I’ve ever used! The fins are just like the omer’s. Mask is very comfortable fogging a bit but I did the lighter trick which I saw on your video. I think I’ll probably put toothpaste on it. Haven’t used the belt or the knife I have them for backups. I plan ordering a wetsuit top next and definitely recommend Mako to others looking for great gear! This package has it all. Very pleased. The price is unbeatable. Mako's customer service is unmatched. Shipping was extremely fast. I live overseas and it came in less than a week.